The reason thread lifts emerged because several individuals would want to have a facelift, but couldn’t afford it or didn’t want the long recovery time of the standard facelift. The popularity of this procedure might have decreased but if it’s done properly they can still be a useful tool. It’s probably better considered as a lesser or preliminary procedure. This surgical procedure cost less and need less downtime for several people. It’s seen that some surgeons promote this procedure as a lunchtime lift or weekend facelift. Generally, it can be performed in about an hour. It’s a general tendency that as we age, our facial support structure weakens and as a result, we lose facial fat. Typically, the areas that get affected include the eyebrows, cheeks and other areas around the eyes, the neck, and the jowls. The result is a longer, older looking face. People who are young in age might experience cheek and brow ptosis ( sagging due to weakened muscles) as well. For these individuals, especially, this procedure might be a good option to the more invasive procedures essential to correct problems in the faces of older people. Individuals having minimal signs of aging and who need just a small lift are the perfect candidates for thread lifts. Most individuals who undergo thread lifts are women between 35 and 45. They opt for this procedure as they have begun to see more prominence of the jaw, a relaxed mild facial appearance or slight bags under the eyes or on the neck. 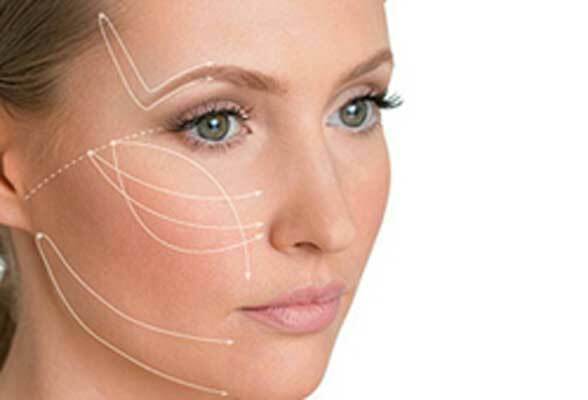 People with high age might undergo a thread lift during the more aggressive facelift procedure to provide additional support for the soft tissue area that was elevated in the facelift. Other candidates for this procedure include those who have had some relapse from an earlier plastic surgery procedure such as neck lift or facelift. Several physicians combine this procedure with others such as neck, chin and brow lifts. During the procedure, your surgeon might instruct you to refrain from eating or drinking after midnight before the procedure. He could prescribe an antibiotic to take in advance and tell you to stop taking certain other medications. During the procedure, your surgeon will make small incisions in key locations and insert a threaded needle to lift the subcutaneous tissue and suspend the lift with the thread. The barbs on these threads will lock in place and encourage the formation of collagen upon insertion to lift very precise areas. The experience was very good. Am happy with the treatment and the way doctor diagnosed. Will definitely recommend to others. Skin & Surgery International is the best skin clinic in Aundh, Pune for any type of skin problems like laser hair removal, hair transplantation and skin care treatment. Dr. Pradeep Kumari are the best dermatologist. She provides best and effective solutions to our skin & hair problems. very nice experience . nice ambiance. very good doctors. ultramodern therapy for pimples and pimple marks . getting good result. Want a picture perfect ? It is my personal experience for Skin & Surgery International. Getting skin surgery is just simply amazing and something like true magic. Excellent feeling after meeting Nitin Sir. He is very friendly and talks about the problem explains it and suggests the best way to overcome it. Unlike other docs who are just interested in prescribing medicine and least interested in hearing patients problem. Dr nitin n dr pradeep both are very friendly and polite, explained the root cause of my acne problem in detail and started the treatment accordingly. Have done 2 sittings till now and the difference from the start of the treatment to date is very much visible. Very positive about the whole process and can’t wait to see my clear face after the completion of the treatment. The time I entered in clinic , I have been handled in just 5 min of time and also an explanation about my disease and given treatment was satisfactory.